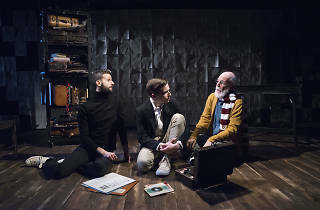 Travis Russ’s lovingly crafted 75-minute play is less concerned with the nitty-gritty of Gorey’s publishing career or his approach to drawing (lots of grumbling and self-criticism) and more with his breezy evasions and elliptical musings on an eccentric, solitary life. A dandyish student at Harvard (his roommate was poet Frank O’Hara), Gorey moved to New York in the 1950s, working in advertising while shopping his weird, cryptic portfolio to magazines. His black-and-white world of tweedy figures and sere landscapes, often captioned with nonsense verse, eventually gained a cult following—a fandom that increased when his art was used in the credit sequence for PBS’s Mystery. 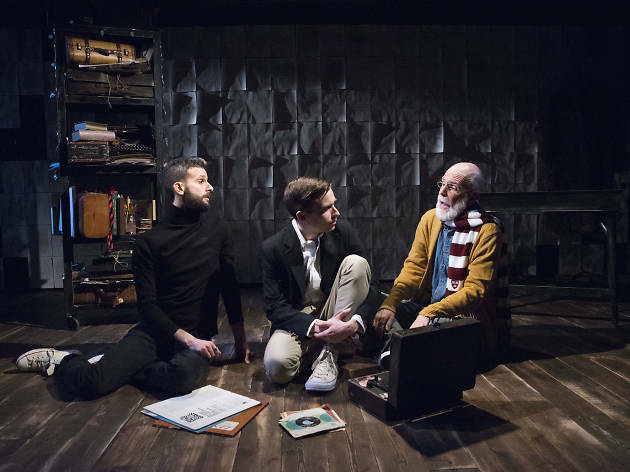 For the proud owner of the anthology Amphigorey and its sequels, The Secret Lives of Edward Gorey (handsomely produced by Life Jacket Theatre Company) is a visit to an old friend who always amuses and sometimes surprises. Newcomers, take care: Gorey’s macabre, intricately detailed universe can addict and overwhelm. The man himself was an object lesson. Sheen Center (Off Broadway). Written and directed Travis Russ. With Andrew Dawson, Phil Gillen, Aidan Sank. Running time: 1hr 15mins. No intermission. Through Jan 14. Click here for full ticket and venue information.